Still looking for that very special Christmas gift? What about these gorgeous pieces of jewellery from Etsy-Seller theBeadAerie? This bracelet really is a statement! 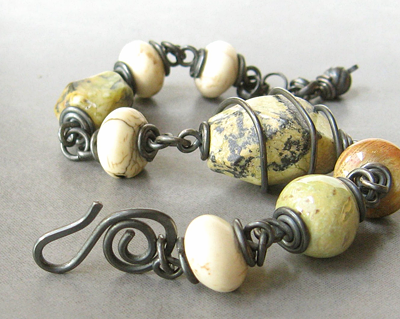 Chunky pieces of turquoise combined with white magnasite, fossilized coral and a Kazuri clay bead from Kenya, all put together with Sterling Silver that has been oxidized and polished to a soft patina. This is the first piece that caught my attention. When Peggy later added this necklace I've been lost completely. 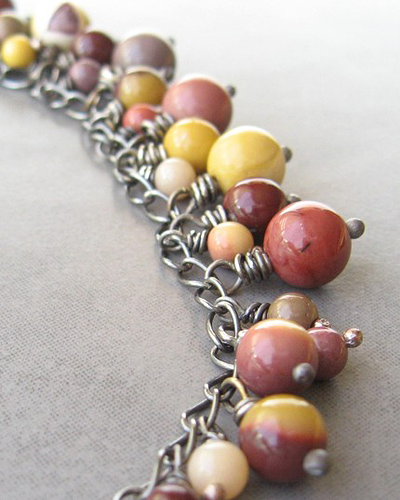 Mookaite jasper beads in an incredible colour range, again with oxidized Sterling Silver. These soft colours and the beads of different sizes are just amazing! Now we come to earrings - my favourite. There are a lot of different earrings in this shop. These here can go with every outfit. 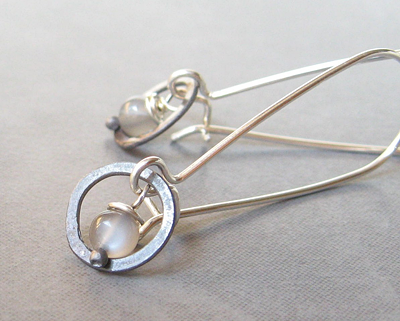 Bright and oxidized Sterling Silver with moonstones - what a combination! That's jewellery for real women, not for bling-bling-girlies. Of course everything is handmade. But not expensive at all. If you want one of these pieces - hurry up! Before I do.